Even if you're becoming more confident in your Japanese reading skills, sometimes an English translation to fall back on can be immensely helpful. 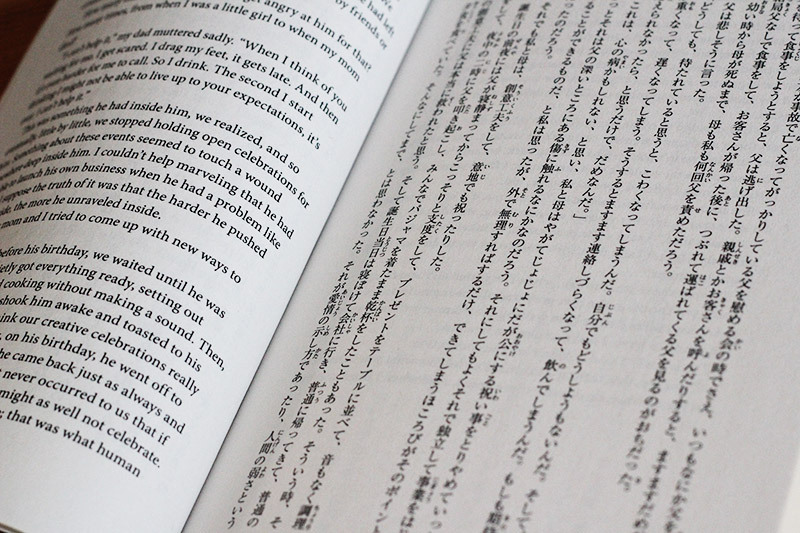 If you've worked your way through Read Real Japanese and Breaking Into Japanese Literature, here is your next step into reading Japanese literature in Japanese. Handholding time is over, but it might still be too early to take off the training wheels completely. This book makes the transition from using follow along dictionaries and notes much smoother. 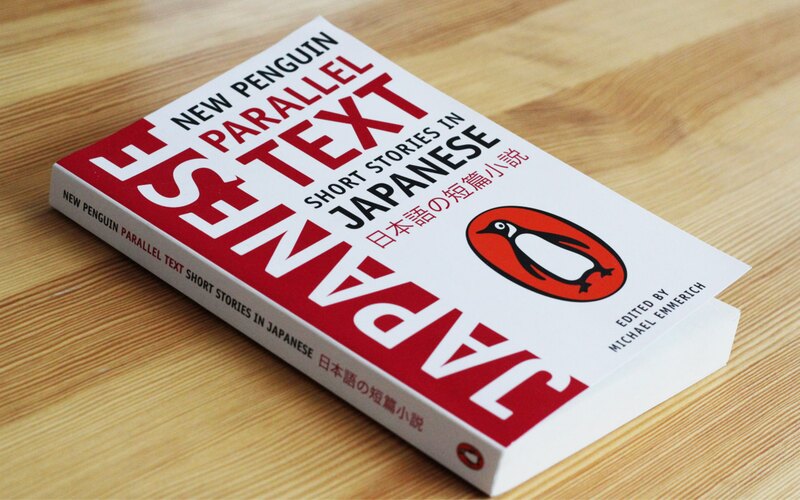 The New Penguin Parallel Text series released Short Stories in Japanese in 2011 and it is one of many successful English → Other Language books (they also have French, Spanish, Russian, etc. if you're interested). It's edited and almost entirely translated by Michael Emmerich, whose name you may recognize from his work on Read Real Japanese: Short Stories. Basically, if you're a fan of the RRJ series, you'll like this as well. The layout is perfect if you are an advanced student of Japanese. It has English on the left and Japanese on the right, in vertical (normal) Japanese format. This means you are reading Japanese the way it is meant to be read. There is no follow-along dictionary like those in Read Real Japanese or Breaking Into Japanese Literature. It has furigana but only the first time you see a word in each story. 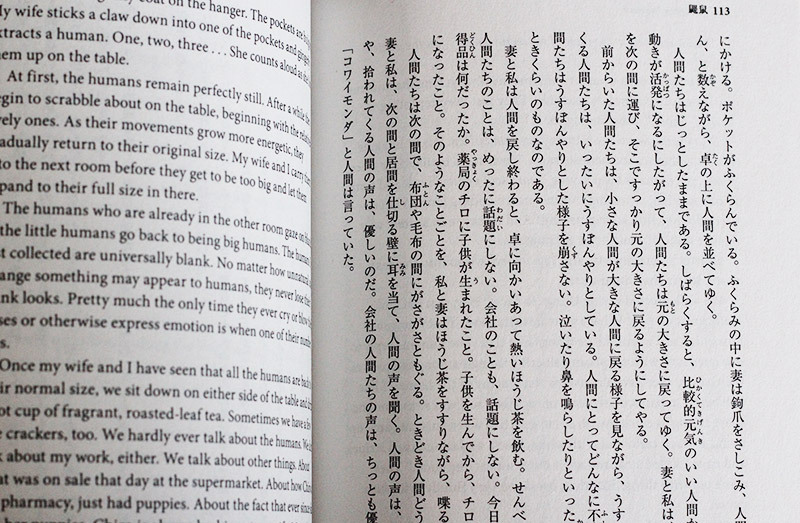 There are notes in the back for each chapter, but only a few and the numbers do not correspond with numbers found in the text. You need to be able to find the line it is referencing on your own. You might even skip them altogether. If this explanation sounds like a list of negatives, then you are probably not at a high enough level to make this book work for you. It is set up this way to make you work. You have to remember. And "cheating" becomes difficult. What I mean is, when you read through beginners and intermediate books for reading Japanese, there is a lot of convenience. But with convenience comes laziness, and it is very easy to read through a story without actually learning anything. Without a follow along dictionary you will be forced to remember the words you have to look up without being able to glance down at the page each time you see it. Similarly, with furigana only appearing with new words, you will have to remember the readings yourself. Looking over at the English page you will be forced to think about why certain translation choices were made in English. You will notice that many translations are not literal. And you will be able to understand why they should not be literal in the first place. 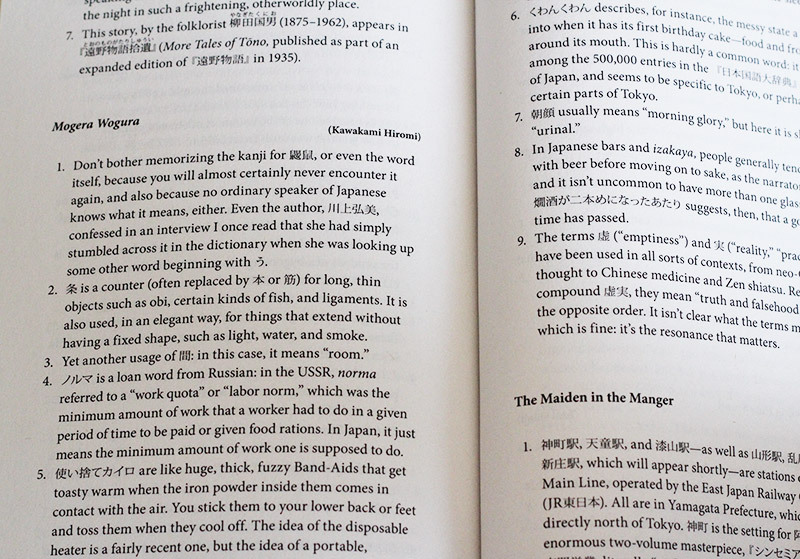 Oh, and did I mention that there is no romaji in this book? Like, at all? This book finally stops babying the reader and filling pages with something that, at this level, you do not need. Now that I'm looking at the titles, they don't seem very interesting. But I promise, they are all very good. They were written between 1980 and the mid-2000s, so that is definitely more contemporary than what is found in other books of this type. Though once again, if you enjoyed the RRJ series, you can see how this is the obvious next step. Even if you don't read the Japanese, even if you don't think you are ready, the English translations can stand alone. You can read down the left side pages, through the entire thing, without reading one word of Japanese and still enjoy these stories for what they are. Some of them are unsettling, some a bit strange, and the last one is even a bit pornographic at times (though not in an enjoyable way). Another huge plus is that a lot of these stories have never been translated anywhere else. This is the only place you'll find them in English. So, as I said before, if you just want a small collection of Japanese short stories it's great for that purpose as well. This book is fantastic if you are at the right place in your studies. If you are not there yet, you can always read through the English translations just to enjoy Japanese literature that is not available in English anywhere else. If you want to push yourself to the next level without jumping right into stand alone Japanese literature, this is the book for you. The stories are interesting, fresh, and engaging. The translations are very well done. And it is honestly something I'm glad I took the time to read through. This is probably the only parallel text where I enjoyed most of the stories. The notes were incredibly helpful, and it really felt like I was finally at the point where I could read and understand literature without the crutch of a dictionary.